Editor’s Note: It is important to have up-to-date information on health - learn what our colleagues at FDA have to say about finding up-to-date health information on social media. Millions of consumers are using digital media to get health information, applications to monitor health conditions, and social media to find people who share similar health-related concerns and experiences. Some of this information will be up-to-date and trustworthy; some will not. How can you tell the good from the bad? Tweeting, Posting, and Downloading Health InformationThe use of social media for health communication is on the rise – both as a resource for consumers and as an outreach tool for health care providers. Facebook, YouTube, Twitter, and other forms of social media provide an opportunity for consumers to share information about personal health experiences and seek information from others. Mobile apps provide a convenient way for users to track health-related information and activities; including when and what medications to take, blood sugar levels, and blood pressure, for example. However, like Web sites, not all social media outlets are safe and reliable. Many of the steps that should be taken to evaluate the safety and reliability of a Web site should also be used when using social media. For example: Is a product being offered for sale? Is the discussion about a new “miracle” treatment? Or is the source of the discussion or information unclear? 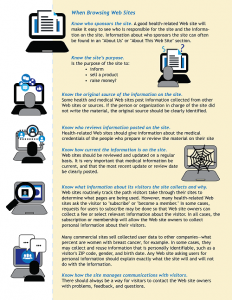 Users also must be careful of medical misinformation – information that is outdated or based on word of mouth. Personal blogs and Twitter sites that discuss health matters are seldom, if ever, regulated. Use caution when using Web sites and social media as a tool in your health care and always contact your health care provider before following medical advice or taking products promoted on the internet. This DHHS site provides resources on a wide range of health topics selected from approximately 1,400 government and non-profit organizations. This consumer-oriented Web site established by the National Library of Medicine provides information about diseases, conditions, and wellness issues. This MEDLINEplus page provides information on evaluating the reliability of health information found online, in magazines and on television. This site, created by the National Institutes of Health and the U.S. Food and Drug Administration, provides patients, family members, and members of the public with easy access to information on publicly and privately supported clinical studies on a wide range of diseases and conditions. The FTC enforces consumer protection laws. The agency investigates complaints about false and misleading health claims posted online. This site provides information on health and fitness related fraud. Contact HIV.gov's Virtual Office Hours for free social media technical assistance on how you can use your social media to disseminate health information to the HIV community.